This tasty frittata made with olive oil instead of butter is also packed with veggies to start your day off right. Studies have shown that your body absorbs nutrients from greens and vegetables such as tomatoes better when they are consumed with a monounsaturated fat like olive oil. Bon Appetit! Beat eggs with water and then beat parmesan into the egg mixture and reserve. Combine garlic, shallot, potato, roasted pepper, parsley, and basil and set aside. Heat extra virgin olive oil in a 12” nonstick sauté pan over high heat. Add mushrooms and sauté until they start to brown. Reduce heat to medium and add the reserved vegetable mixture. Sauté for about 1 ½ minutes. Season with salt and pepper to taste. Add a little additional olive oil if needed then add the reserved egg mixture to the hot sauté pan. Cook 2 to 3 minutes until egg cooks and sets on the bottom. Transfer the sauté pan to the broiler and broil until light and fluffy and almost totally set, about 2 - 3 minutes. Sprinkle fontina cheese on top of the frittata and place back under the broiler just until melted, about 2 – 3 minutes. Remove to a cutting board and cut into 6 triangle servings. Place one serving into the center of the plate. 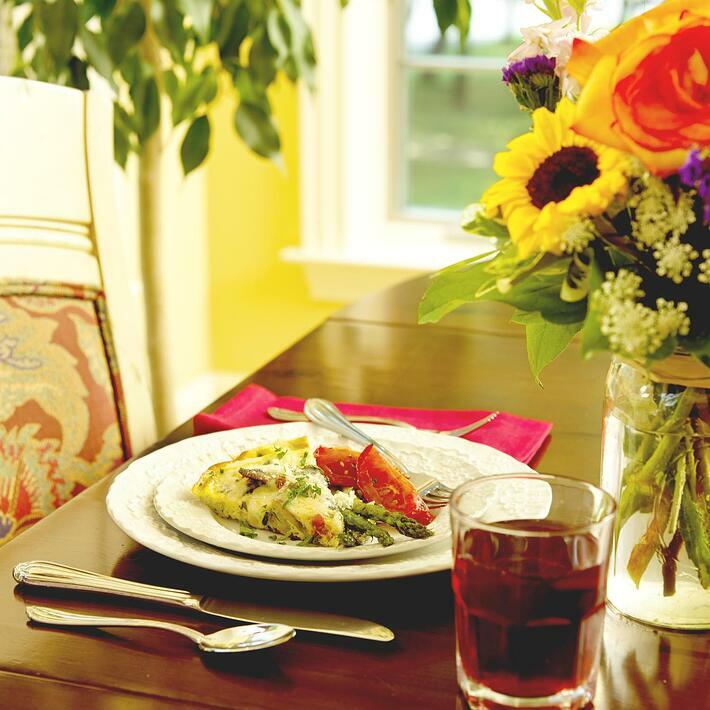 Garnish each frittata portion with four stalks of hot roasted asparagus and two wedges of roasted tomato. Sprinkle each portion with parmesan. Preheat oven to 400 degrees. Combine parsley, lemon zest, and garlic. Set aside. Place asparagus on a sheet pan and drizzle with olive oil. Season with salt and pepper. Spread the asparagus into one layer and roast for about 15 to 20 minutes. Sprinkle with parsley mixture and place back in the oven for 3 to 5 minutes. Preheat oven to 400 degrees. Combine all ingredients gently and transfer to a sheet pan lined with baking paper. Roast for about 20 minutes or until done.